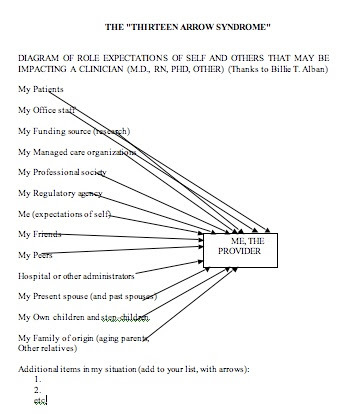 This diagram maps some of the more significant stresses on a health professional. I'm grateful to Billie T. Alban for this concept and most of the content. I used the diagram in Intravenous Hope, Stat! As you can see, there are many arrows already, and some professionals will add arrows between elements. For example, patients may harass office staff, so an arrow could go from the former to the latter. Some of the terms in the diagram may not apply to you. If you and a peer each did a diagram, some of your common items might have connecting arrows stretching from your diagram over to theirs. 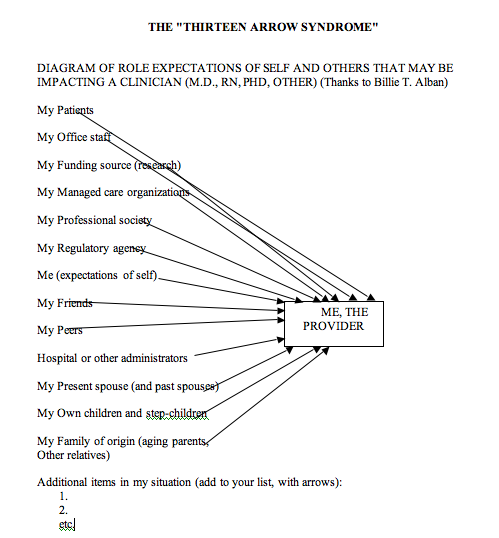 If you are an administrator, you might have arrows joining staff members' diagrams to items in yours. Different professions may emphasize different items, and the connections between, say, a nurse's diagram and a physician's could prove consciousness-raising. They might list some items in common, and others unique to their professions. The common items could be a source of support or conflict. I'll include a quote from the book below the diagram. Quote from Intravenous Hope, Sat! 1. What do they want from me? That is, are staff looking for support for their decisions? Are patients looking for a cure? Is that expectation unrealistic or not? Are hospital administrators looking for more opportunities to bill? 2. How am I responding? Are you putting off unpleasant discussions? Avoiding deadlines? Taking too much of the responsibility on your shoulders instead of delegating? Becoming overloaded with too many duties? 3. Recognize when you can't fulfill an expectation and say why. This boils down to "I can't do that because _____________." 4. Ask yourself: "Do I feel this is a big deal? What makes it big?" This can help clarify priorities and set aside minor issues if other concerns take priority. 5. Recognize when a person needs just a sounding board versus when they need concrete advice. In the first instance, you listen and ask questions to help the person clarify their thinking, their confusion, or their conflict. In the second, you also listen and question but you go on to tell them what you might do, or what you think they ought to do. End of excerpt from Intravenous Hope, Stat!